Wani Michael grimaces, then digs with both hands into the pile of foul trash. It's hot - hotter than usual during the rainy season, and the burning sun intensifies the stench of rotten garbage on the roadside. It's not a fun task he and hundreds of other young people have chosen for this sunny Saturday morning. But they won't be swayed from their mission: Cleaning the streets of South Sudan's capital Juba - both literally and symbolically. "We want to tell our leadership that if we can clean up our streets, we can clean up our country," Michael, co-organizer of the protest and executive director of the Okay Africa Foundation, told DW. Under the banner #NadafaLeBeledna, which means "cleaning our nation" in the local language Juba Arabic, several youth groups are combining environmental protection with a call to end the brutal five-year civil war, which has killed an estimated 380,000 people and destroyed the country's economy. "As young people, we have a responsibility to bring about peace and coexistence among ourselves," Michael added. Surrounded by music from a sound system installed on a truck, and equipped with brooms, gloves and dust masks, the youth move from street to street in the city center. They find garbage everywhere they go. Piles of rubbish rot on the roadside, plastic bottles lie in ditches. Some of the groups make it to the parliament and clean in front of the bullet-riddled wall surrounding the government building. Bystanders look with eyes wide open; some spontaneously join in and pick up trash, others keep on staring in disbelief -- most people typically avoid government buildings, which are protected by soldiers armed with machine guns. South Sudan celebrated independence from Sudan in 2011 after decades of civil war, but then plunged into a new conflict in 2013 when President Salva Kiir accused then Vice President Riek Machar of plotting a coup against him. Violence erupted between the two factions, feeding on the country's ethnic tensions. 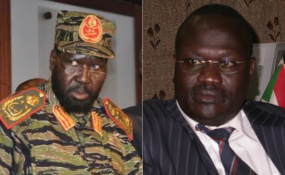 Kiir and Machar signed a peace agreement in August aimed at ending the brutal war. Previous ceasefires and peace agreements have broken down. The public, especially young people, are tired of the conflict, and are ready to move on. The cleaning is a symbol of people coming together, says Peter Malir Biar, who works for a local Christian nongovernmental organization and co-organized the cleanup. "The purpose is that young people from different, diverse backgrounds come together and move forward for peace, unity and prosperity. These are signs that South Sudanese can do more things than fighting," Biar told DW. Juba's mayor, deputy mayor and several army members were also invited to join the event. Officials need to give their blessing for the movement to avoid problems with the police, explained Biar. The officials hold speeches, swipe the broom around for a few photos and then leave. Only Joseph Africano Bartel, undersecretary of the Ministry of Environment and Forestry, stayed longer and actually helped collect trash. He is aware of the waste problem and associated health risks in the rapidly growing city of Juba. South Sudan has no official garbage collection and disposal system. "There used to be a recycling site in Juba, but it was destroyed in the war," Bartel told DW. Garbage pollutes rivers and other water bodies, contributing to cholera, skin infections and other diseases. Juba saw its latest cholera outbreak in 2017. In South Sudan's First State of Environment and Outlook Report published this year, the government announced plans to adopt "reduction, reuse, recycle and resource management." In July, the country banned plastic bags. Bartel plans to introduce high taxes on small plastic bottles to encourage people to buy big water tanks to reduce waste. The goal is to become "better than Rwanda," said Bartel, referring to the green image of the small East African country. But so far, protecting the environment has not been a priority in the war-torn country where there are more urgent matters to deal with. Six out of 10 people face severe food insecurity, half of the population is displaced and unemployment is high. The country's currency has fallen sharply. Five years ago, $1 (€ 0.87) bought 5 South Sudanese pounds; the current exchange rate is $1 to 130 South Sudanese pounds. Even people who do have jobs struggle to make ends meet. In South Sudan, problems are myriad and the solutions aren't easy. But exactly this challenge forms the background of why the youth are cleaning the city. It's something they can do that shows results immediately, says Sony Valentino, one of the activists. "Youth in South Sudan is known for doing things that are violent -- but today, we want to prove to the world that the youth can also participate in developmental aspects, like cleaning the city and doing something fruitful for the country," she told DW. The youth groups have another, more tactical reason for choosing garbage collection as a form of protest: While the government has welcomed youth participation in the current peace deal, they have been cracking down on people who openly criticize the country's leadership. At the end of July, peace activist Peter Biar Ajak was arrested, and is still being held without charge. Michael, one of the organizers of the cleaning movement, gets regularly interrogated by security forces. To avoid getting into trouble, the youth groups found a creative way to voice their criticism of politicians who fail to bring peace. "Nobody will arrest us for cleaning the streets," says Michael. Reporting for this story was supported by the African Great Lakes Reporting Initiative, a program of the International Women's Media Foundation.